Your patio doors provide a bridge between your indoor living spaces and those you create outdoors. At Gerald Jones, we understand that the quality of a home’s patio doors contributes to its energy efficiency, which is why we offer the highest quality patio doors and sliding doors to our clients. We offer our patio door and screen door services to homeowners of the Raleigh, Durham and beyond. Gerald Jones Company has the experience necessary to properly install hinged sliding glass doors, sidelights, screen doors, French doors, stationary panels, transoms and sliding glass doors on any style home. Our doors come in a multitude of different colors and materials. Different glass types and patterns can also be integrated upon request. No matter what custom configuration the customer wants, Gerald Jones is happy to deliver. 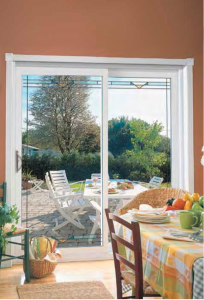 For customers wanting competitively priced, easy-care exterior options, vinyl patio doors remain a great option. For those looking for incredible strength and durability, fiberglass is known to withstand all kinds of adverse weather conditions. For good looks, wood sliding patio doors offer fine craftsmanship and value. All of which come with built-in blind options to offer privacy and flexibility while delivering a certain level of practicality. Gerald Jones promises each and every order will ship timely to customers across the Triangle and surrounding regions. For prompt service, please contact us at 919-286-1700 to connect with a member of our sales team.